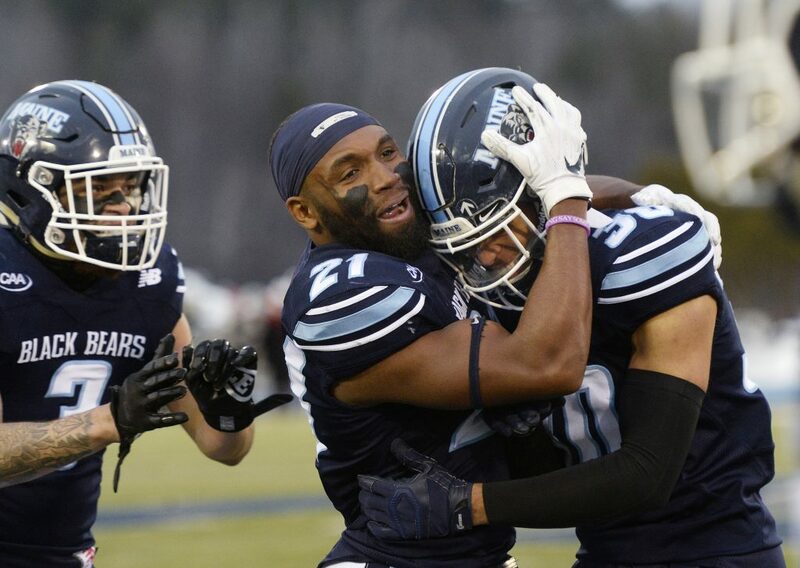 Chris Ferguson throws a school-record five TD passes and Earnest Edwards scores three times as Maine advances in the FCS playoffs. 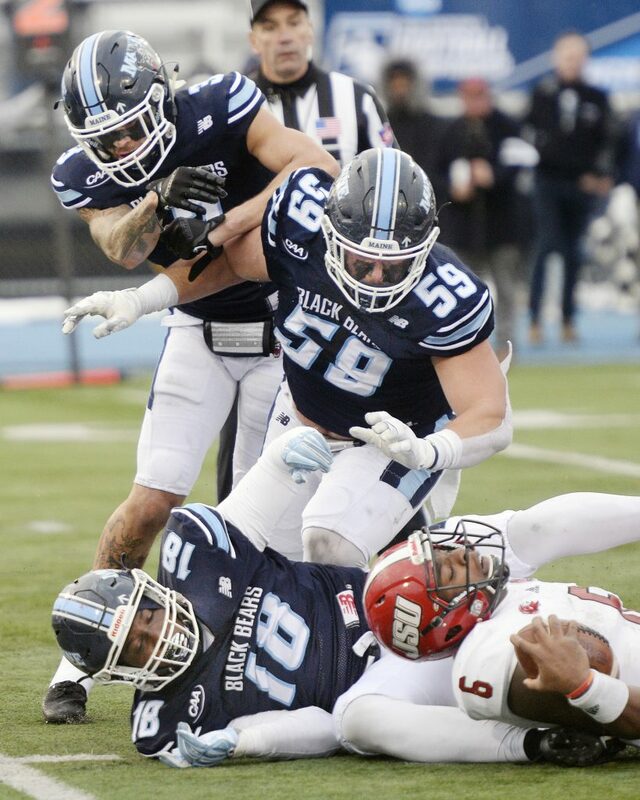 ORONO — All week long, the talk had been about whether the University of Maine’s nationally ranked defense could handle Jacksonville State University’s nationally ranked offense. Maybe the focus should have been on the other side of the ball. 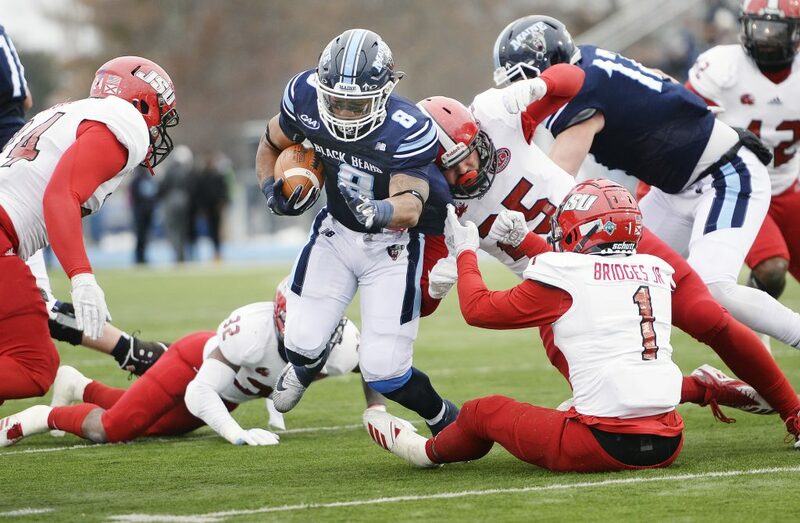 Maine put on an offensive show Saturday afternoon, thumping the Gamecocks 55-27 in the second round of the Football Championship Subdivision playoffs before a crowd of 6,145 at Alfond Stadium. 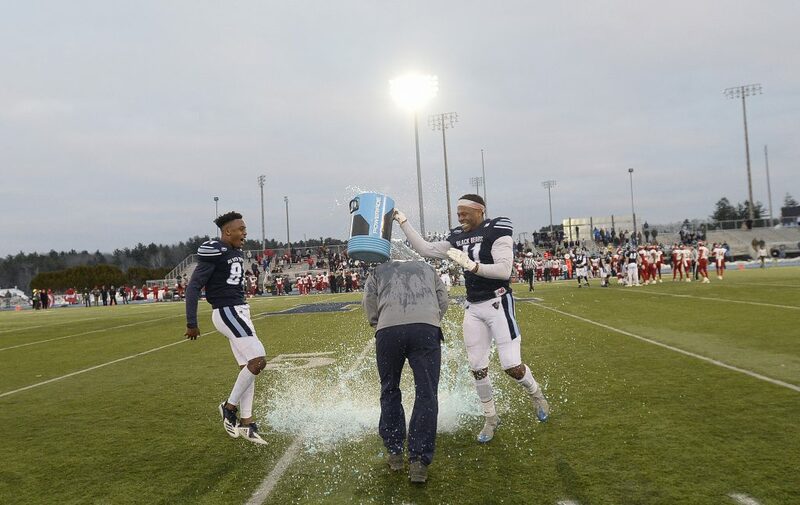 It was the first home playoff win in the program’s history. 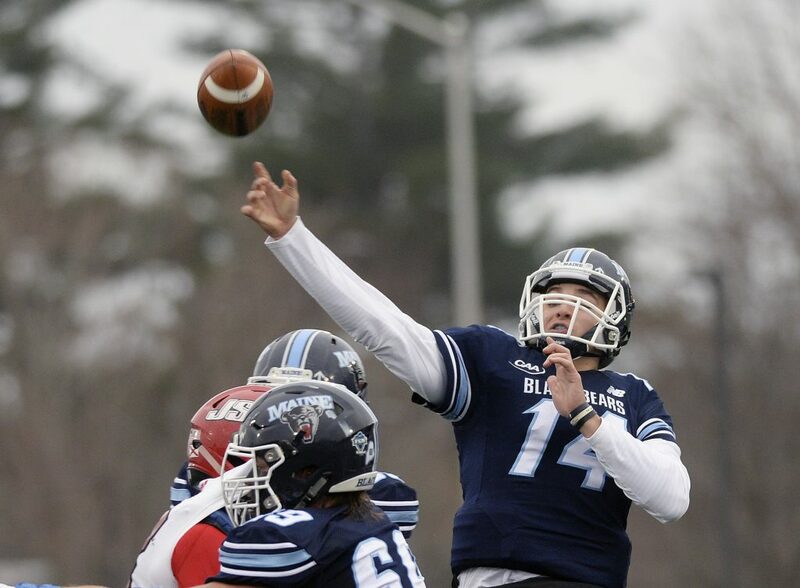 Quarterback Chris Ferguson, who missed parts of the last two games because of a recurring injury to his right shoulder, threw a Maine playoff-record five touchdown passes. Earnest Edwards scored three touchdowns, and Ramon Jefferson rushed for a career-high 186 yards and two touchdowns. 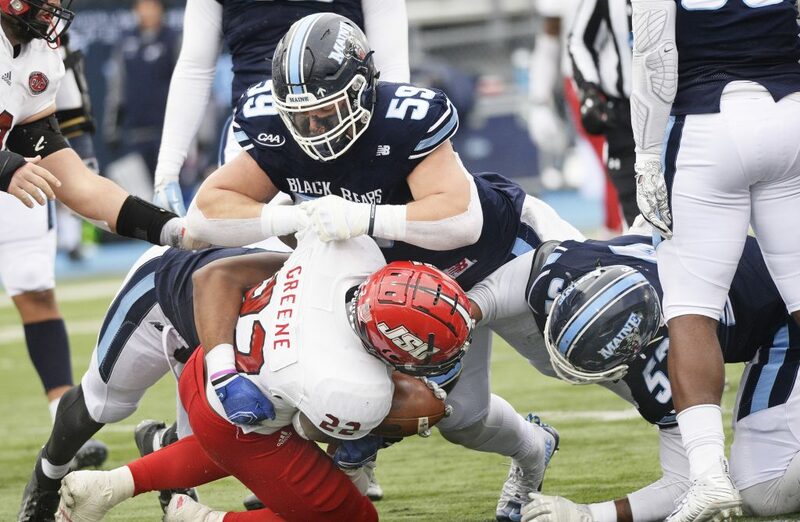 Maine (9-3) jumped out to a 21-0 lead in the first quarter and extended it to 42-14 by halftime as it advanced to the quarterfinals at second-seeded Weber State in Ogden, Utah. The game is scheduled for 8 p.m. Friday and will be on ESPN2. 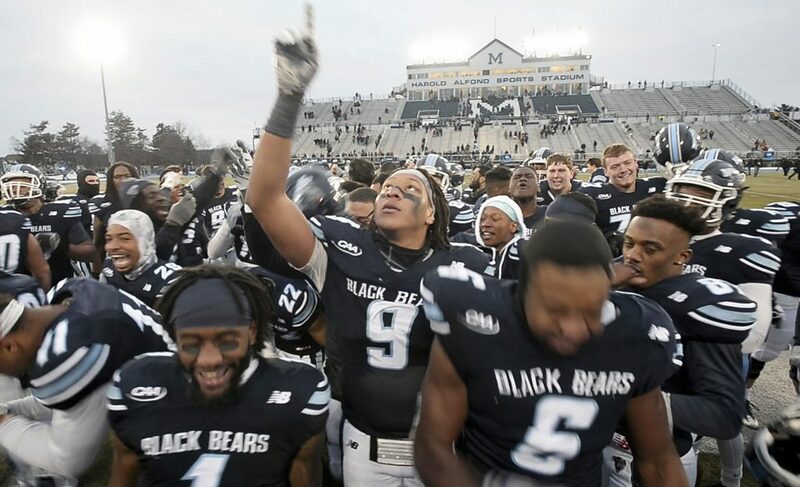 The Black Bears set team playoff records for points in a game, points scored in a quarter (21, in both the first and second quarters) and first downs (26), and tied a record by averaging 6.0 yards per rush. Ferguson said the offense had something to prove. 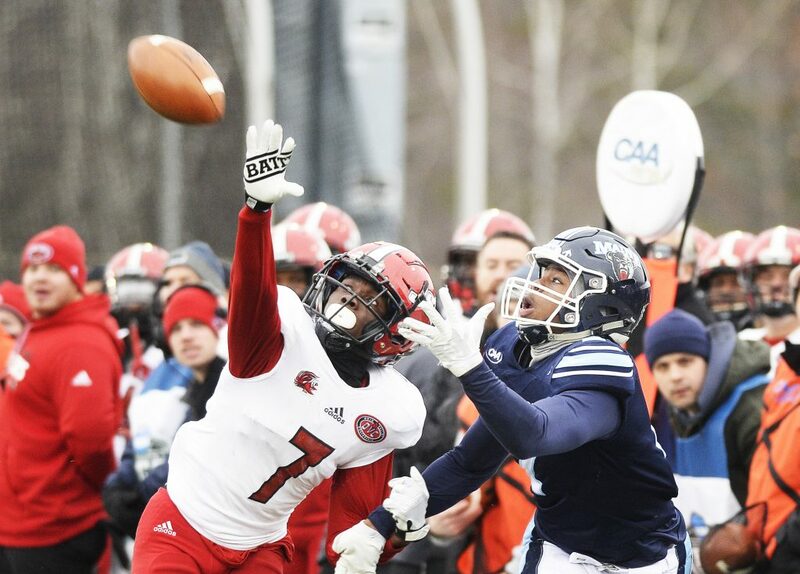 Maine’s defense wasn’t about to be overlooked, either. 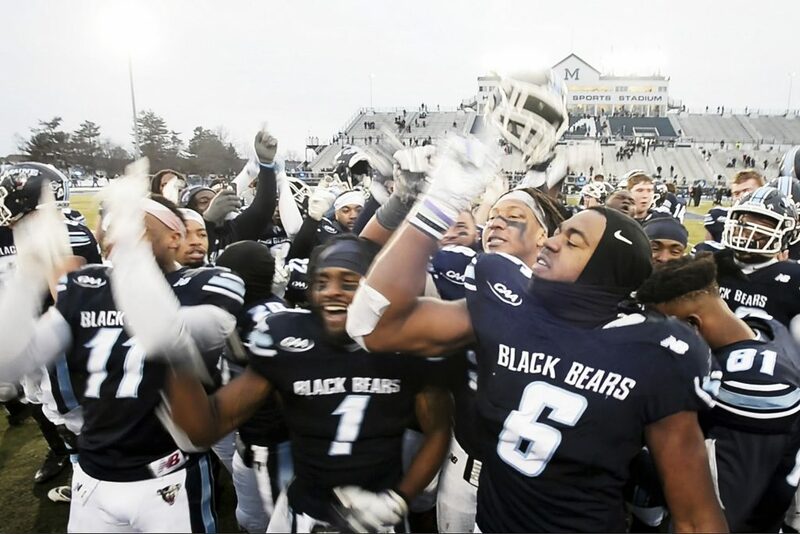 The Black Bears set a team playoff record with four sacks, recovered two fumbles that led to touchdowns and held the Gamecocks to 87 rushing yards – 122.5 below their average. Maine took control quickly. 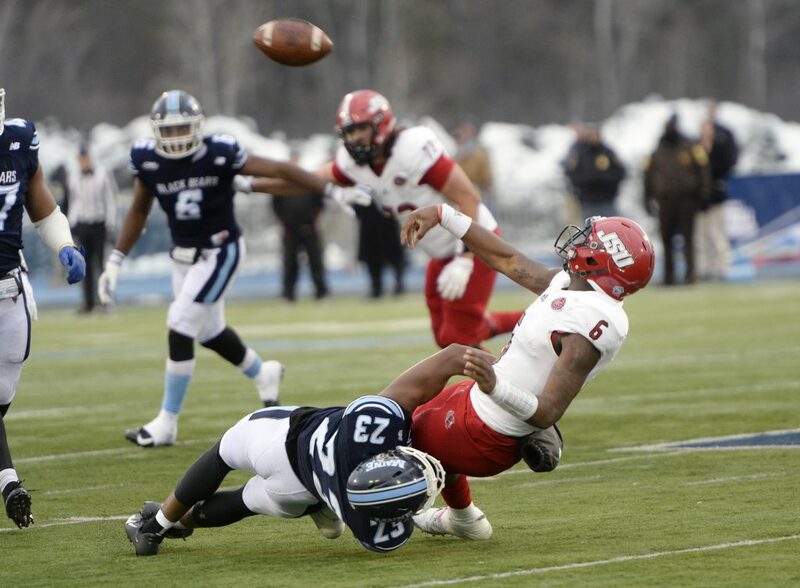 On the Gamecocks’ first series, Zerrick Cooper was sacked by Kayon Whitaker and fumbled, with Jamehl Wiley recovering the ball at the JSU 4. On first down, Ferguson lofted a perfect fade to Jaquan Blair in the right corner, and it was 7-0 following Kenny Doak’s PAT. The defense forced a punt, and Ferguson found Edwards for a 41-yard touchdown to make it 14-0 with 5:28 left in the first. The Gamecocks then went for it on fourth-and-1 at their 47, only to have Leander Burrowes stopped for no gain by Deshawn Stevens. That led to a 4-yard touchdown pass from Ferguson to Edwards and a 21-0 lead. The Gamecocks answered with two lightning-quick touchdown passes from Cooper to Jamari Hester, for 36 and 70 yards, to pull within 21-14. But Maine responded, moving 73 yards in three plays. A 42-yard run by Jefferson set up a 20-yard pass from Ferguson to Micah Wright, another lob into the left corner. Three plays later, Cooper fumbled again when hit by a blitzing Mozai Nelson, and Maine’s Sterling Sheffield recovered at the 15. Edwards scored his third touchdown on a 1-yard play in which he took a lateral from Ferguson to the left, then reversed his direction all the way to the right side of the field. 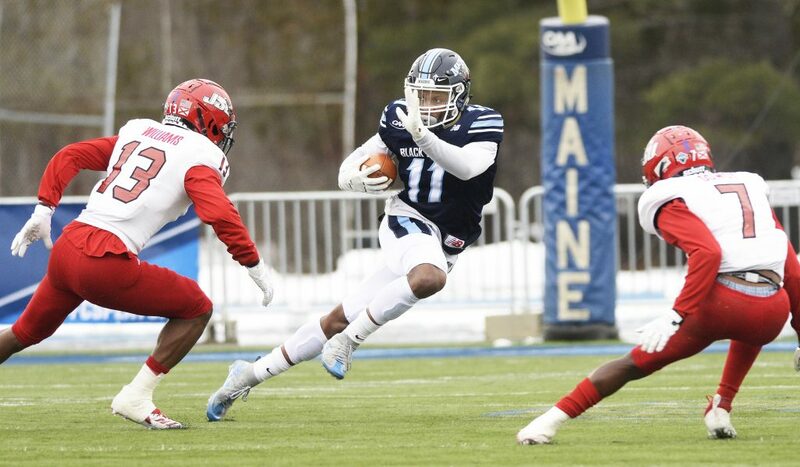 Jefferson later scored on a 24-yard run, and Maine took a 42-14 lead into the halftime break. Ferguson got his fifth touchdown pass in the third quarter – 3 yards to Drew Belcher. Jefferson capped the scoring with a 1-yard run late in the fourth quarter.